These are the perfect "make-ahead" breakfast item! Keeping you out of the drive thru, and something you can make ahead to heat just as you are leaving and eat on the go! **optional add ins - broccoli, bell pepper, mushrooms, shrimp or crabmeat. Cook sausage in skillet and add spinach at the end. Set aside and blot with paper towels so your egg puffs are not greasy. Spray a muffin pan with cooking spray. 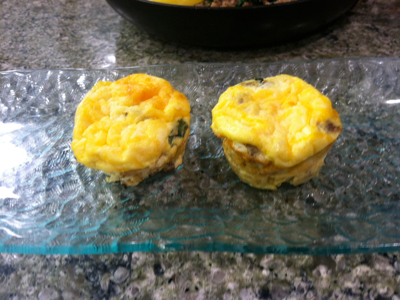 Scoop sausage-spinach mixture evenly into muffin pans. In a large mixing bowl (preferably one with a pour spout) whisk eggs, soymilk (or milk) Greek yogurt, salt and pepper and hot sauce together. Pour over sausage mixture, then top each with cheese. Bake at 350 for 20 to 25 minutes. *Can make ahead and freeze for busy mornings to reheat. **Add other vegetables or seafood to this mixture, too!